This video is great to watch if you have not been to Buenos Aires. It gives a good brief visual overview of the history and culture of Buenos Aires and Argentina. It may help you to decide whether you want to visit or not. My guess is that it will! The other interesting thing about this video (for me at least) is that if you jump to 2.19 and 2.48 you will spot a well-known tango dancer dancing at Confitera Ideal. Hint: he is tall and good at juggling. If it's not who I'm thinking it is, then this Aussie tanguero has a doppelganger! Did you guess the venue where he is dancing? It's the Confiterea Ideal. 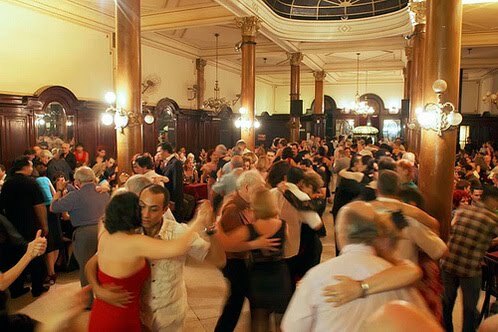 It was established in 1912 and it has been hosting daily open dances for nearly as long as the dance has been around. Always fun to spot someone you know in a random video!